Ok, we understand the tragedy of the commons. And we accept that private property ownership can reduce pollution. But how does that play out for the world’s oceans? Even if the oceans were privatized and you could buy, say an acre of ocean off the coast of California, you only own the water and fish while it and they are within your boundaries. You can choose not to pollute and not to fish, but what if your neighbors decide to kill every fish that enters their boundaries, or decide to grow some oxygen sucking algae for energy use, that kills fish? Given that there are ocean currents and fish that travel long distances, how does anarchical environmentalism work in the oceans? Is this a different problem than the issue presents for landowners? Does anyone have a hypothetical scenario in which private property rights in the ocean reduces pollution or improves fisheries? I hate getting into these types of discussions: ” Libertarian principles are based on the simple premise that an individual or group (a), may use violence to exclude an individual or group (b), from a place, a resource, or the necessities for survival. But that for profit they may sell those items that they have used force to “own”. Libertarians love the idea that you are “free to buy” that potato, and no one will make you buy it. And they are free to use violence to stop you planting your own potato. It is after all, their land, you intend to grow the patented seed on. And that would be theft. ” So, private property rights. I own myself and the fruits of my labours. This guy tried to argue a previous time that if others wanted to come onto my property then I had no right to stop them if they wanted to use that land or take resources I owned that they needed. For a start, they’re entering my property without permission. Then they are acting against me with violence themselves, so I have the right to defend myself. I’ll be asking him: how did I obtain my land through force in the first place, because I don’t recall having done that. Why this group or individual would want to approach me with the intention of using violence against me I want to be able to explain clearly and simply why I have the right to own my land, defend my land, and not share my resources should I so choose, but also that it wouldn’t be in my best interests to not share my resources in voluntary exchange. As in, sure you can grow your potatoes, but this is my land and you have to exchange something in return for me allowing you to use my land to grow potatoes, such as your labour, or money etc. I’d really like to put him in his place. Your ideas please. Thanks. First response from me to him: I’ll humour you. How did I obtain this land through the use of force? I own this land. You know it;s my land, otherwise you wouldn’t be wanting to use force against me to enter my property without my permission so you can grow your potatoes. Why do you believe that you have the right to enter my property without my permission and help yourself to its use? Why do you just not ask for permission to enter? Why do you not just ask for permission to use my land? Why do you think that I wouldn’t voluntarily allow you to enter my property and make use of my land? I own my house and several investment properties. I purchased them from people who purchased them from people who purchased them from people. Earlier on, ownership of them was granted to people after the American revolution took possession by military might. Prior to that, it was granted by the King of England. Prior to that, people came into “ownership” by conquest (i.e., militarily taking them by force from prior inhabitants), and prior to that, by exploration (i.e., taking them by force from nature). Is this “might makes right” the original source of property ownership, or are there some brilliant Libertarian minds, wiser than I, who have postulated grander justification for the original source of the right of ownership of property? What is property, and why is it necessary? 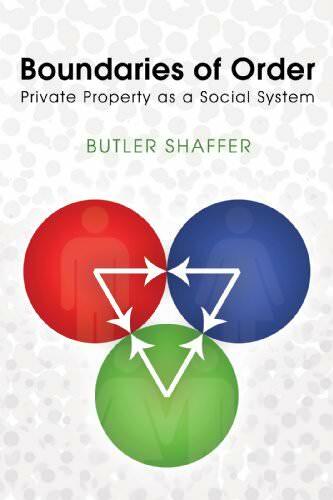 Butler Shaffer argues that coercive, top-down central planning is the negation of liberty and property rights, and argues that we need no such overarching institutions. What we need, he believes, is a system built on the respect for boundaries. Far from a solipsistic prescription, property rights are the foundation for cooperation and mutual exchange — the building blocks of society. Come hear the great Butler Shaffer speak on property, and bring your questions! Western Civilization--the American version in particular--is in a very turbulent and, perhaps terminal condition. The sense of civility that helps give meaning to a "civilization" is in full retreat. Butler Shaffer has, over the course of several years, written 51 wonderful essays observing the dissolution of Western culture and civilization. They have been assembled in the The Wizards of Ozymandias a captivating work full of entertaining epigrams and anecdotes, as well as enlightening commentary on current events, and historical episodes, that will keep you engaged and immersed from the first to last page. Shaffer's intellectual prowess and deep well of life experience enlightens and rouses introspection at every turn. It is immediately evident that the author has been writing on law, economics, and history for decades. Butler Shaffer joins Liberty.me LIVE once again to speak on the destruction of Western civilization, and invites you to come and ask your questions. In Butler Shaffer's meticulously-documented In Restraint of Trade: The Business Campaign Against Competition 1918-1938, he paints a picture of Big Business and its desperate fight to be... regulated? That's right -- Shaffer's work (reminiscent of Gabriel Kolko and John T. Flynn) shows how Big Business lobbied to impose regulations on their industries in order to stamp out competition and raise barriers to entry. From steel to textiles, Shaffer names names and exposes corruption in a sweeping assault on crony corporatism. On Thursday, December 18th at 8pm EST, Shaffer will discuss this period of regulatory history and what has (or hasn't) changed since then -- don't miss it! Calculated Chaos: Butler Shaffer LIVE! Institutions are the foundation of our society, but are they really necessary? Instead of providing peace, order and coordination, we live with discord, agony, and violence. Can we learn how to organize without creating social Frankensteins, without institutions, without politics? The one and only Butler Shaffer, author of the book Calculated Chaos: Institutional Threats to Peace and Human Survival, will give his thoughts and take your questions on the topic of whether we truly need states to govern our lives. Join us for this very special event Thursday, December 4th at 8pm EST!